Vanessa Swenson's "Glimpses" series was partly inspired by the artist's love of nature. When Vanessa Swenson returned to her hometown of Spokane three-ish years ago, she didn't intend to stay. But after she realized how much the city and its art community had changed since heading to college at Montana State University, Swenson remembers feeling surprised, and so she thus replanted her Inland Northwest roots. Since then, the designer and artist has been beyond busy, and whether you know it or not, you've seen her artistic touches around the city: branding for Create Spokane Arts Month, Terrain and the Chinese Lantern Festival, paint-by-number community murals in Riverfront Park, film posters for the Spokane International Film Festival, and much more. Her work is also featured on beer labels and merch for Ellensburg's Iron Horse Brewery. 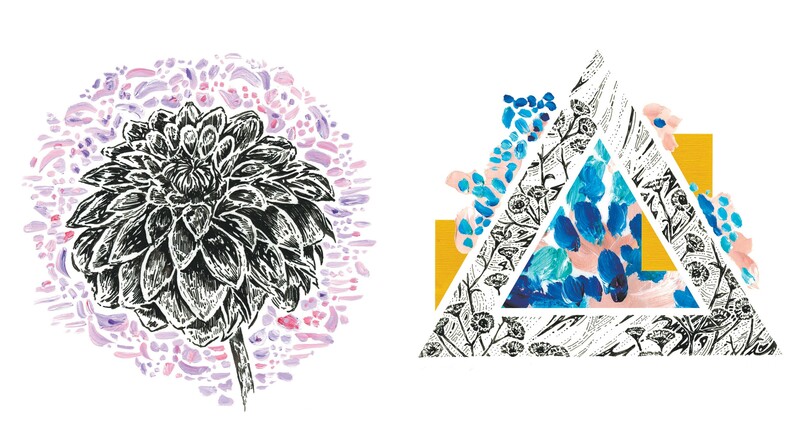 Working in a combination of digital and handmade art processes, Swenson currently employs her artistic talents as an independent designer based out of Fellow Coworking, a fitting setting for her first solo art show this month. "Glimpses" captures Swenson's personal design aesthetic — her style is simultaneously geometric and abstract, yet also natural and soothing — and her own deep love of exploring the natural environment that surrounds us. "... Often words fail me when trying to describe the awe in which I see. My eye takes it all in pieces at a time, glimpses of the whole — a splash of color, an intricate pattern, a basic geometric form. Things that are both simplistic and wildly complex all at once," Swenson writes in her artist statement. Auntie's Bookstore, 402 W. Main, The store hosts its first Friday poetry open mic with "Remember the Word" featured reader Gawain Fadeley. Guest poets can also share up to 3 minutes' worth of material. Art Seed Spokane, 1115 W. First, A closing reception for the River Ridge Association of Fine Arts' group show. Avenue West Gallery, 907 W. Boone, The gallery hosts its annual juried art exhibition, featuring 40 pieces of art ranging from paintings to photography. Barili Cellars, 608 W. Second, Unique mixed-wood wall pieces by Brazilian-born artist Rebeca Abdala. Barrister Winery, 1213 W. Railroad Ave., The winery hosts pieces from The Art Spirit Gallery in Coeur d'Alene, including pieces by Robert Schlegel, Ruth Andre, Simon Levin and Marilyn Lysohir. The Bartlett, 228 W. Sprague, "Presidential" by Karli Ingersoll was inspired by Donald Trump's public statements and tweets. Bistango, 108 N. Post, Blues, pop and soul music by Ron Greene. Bloem Flowers, Chocolates & Paperie, 808 W. Main, Abstract monoprints by Beverly Hill-Kleinstein. Bozzi Gallery, 221 N. Wall, "The New Vintage Collection" features paintings by Jeremy Salazar. Craftsman Cellars, 1194 W. Summit Pkwy., Paintings inspired by nature from Sheila Evans; winery open from 2-9 pm. Echo Boutique, 1033 W. First, A reception showcasing Megan Holden's found-object jewelry and ink illustrations. Fellow Coworking, 304 W. Pacific, "Glimpses" by Vanessa Swenson is a mixed-media series featuring studies of color, texture, pattern and geometry. Free People, 865 W. Main, Local botanical studio Parrish & Grove displays and sells bouquets and flower arrangements. Hills' Restaurant & Lounge, 401 W. Main, Live music by the Front Porch Trio, from 6:30-9:30 pm. Iron Goat Brewing Co., 1302 W. Second, Paintings by Jake Brown, inspired by the passing of time. Keith Powell Gallery, 123 E. Second, Featuring art in various media by Caroll Vrba (sumi-e paintings), Keith Powell (scuplture) and David McMillan (photography/digital pop art). Kolva-Sullivan Gallery, 115 S. Adams, The gallery hosts "Witness," a collection of portraits in various media by artist John deRoulet, all featuring people he met and conversed with last year on the streets of Spokane. LeftBank Wine Bar, 108 N. Washington, Mixed-media drawings by Kim Long, with music by Nick Grow from 4-10 pm. Marketplace Winery, 39 W. Pacific, Live music by Scott Randall and Maxie Ray Mills, from 5:30-9 pm. Marmot Art Space, 1202 W. Summit Pkwy., A solo show featuring the art of San Francisco muralist, painter and designer Elliott C. Nathan. Montvale Event Center, 1017 W. First, "First Friday on First" is a community celebration with live music by Seeking the Elephant, art by Cherry Street Studio, venue tours, food and drink, from 5-9 pm. Nectar Catering & Events, 120 N. Stevens, See a new art installation by Tessa Grosoff and enjoy live music by Jamison Sampson, from 5-10 pm. Patit Creek Cellars, 822 W. Sprague, Music by Dave McRae, from 7-9 pm, with art by Oksana Tepp and members of Spokane Art Seed. River City Brewing Co., 121 S. Cedar, Original watercolors and prints by Bari Cordia Federspiel. River Park Square, 808 W. Main, Live jazz, reggae and funk music by saxophonist Shao Mane, on the first floor from 5-7 pm. Robert Karl Cellars, 115 W. Pacific, A collection of pieces by member artists of Bear Creek Mercantile are on display. Rocket Bakery, 1325 W. First, Watercolors and acrylics by by Rachel Nichols. Spokane Art School, 811 W. Garland, "Dreamscapes: Sketchy Memories" features recent works from Spokane artist Ken Spiering. Spokane Public Library, 906 W. Main, Live music by jazz vocalist and composer Rachel Bade-McMurphy, from 6:30-8 pm. STA Plaza, 701 W. Riverside, Acrylic paintings by Jason Corcoran, from 4-7 pm. Steelhead Bar & Grille, 218 N. Howard, Landscape photography by Nick Nelson. Terrain, 304 W. Pacific, "Snapshot: A Look at Spokane Right Now" features personal views of Spokane from professional and community photographers. Trackside Studio Ceramic Art Gallery, 115 S. Adams, Sculptural and functional ceramic art by member artists Chris Kelsey, Mark Moore and Gina Freuen. Vino! A Wine Shop, 222 S. Washington, Pen and ink drawings by Leslie Cooley.